Saratura on the attack against Granville during the Rotuma Sports Day at Suva Grammar School court yesterday. PHOTO JONA KONATACI. The 2015 Rotuman Games attracted a huge turnout at Suva Grammar School yesterday. 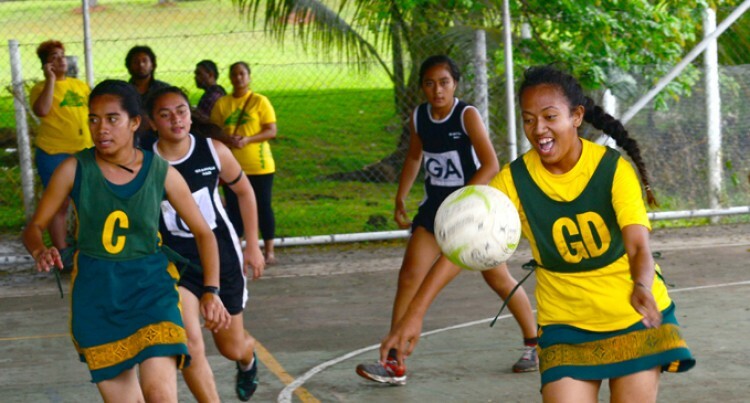 Held this month every year, the annual event attracted seven teams, three from Suva and one from Nadi, Lautoka, Vatukoula and even Rotuma who took part in netball, volleyball, rugby and Touch Rugby. Rae’sea Sports and Social Club president Kevin Iroa said the aim was to develop the skills and talent of Rotumans. “The game’s has been very good in terms of the turnout, even though the weather has not been in our favour, it turned out good for us,” Iroa said. “The aim of this annual event is to not only bring Rotuman’s together but contribute to the development of sports. “As you have seen we have had a few Rotuman’s representing Fiji in various sports.